Swiss architect Walter R. Stahel first introduced the notion of a circular economy in the 1970s. Stahel was one of the forerunners of the sustainability movement, advocating that the industrial economy did not have to be tied to mindless consumption and waste. Instead, Stahel proposed that resources could not only be recovered at the end of their lives, but even upgraded. In 2002 architect William McDonough and chemist Michael Braungart brought the concept of circular product lifecycles to the wider public in their aptly titled book, Cradle to Cradle: Remaking the Way we Make Things. At its core, Cradle-to-Cradle (C2C) design, as opposed to Cradle-to-Grave (i.e. landfill) design, advocates for designs to be modeled on nature’s regenerative cycles. Using the analogy of a colony of ants, McDonough and Braungart propose that productivity does not have to be associated with environmental degradation. Instead, the two authors illustrate a world in which designing for abundance actually bolsters the beauty, health and productivity of our ecosystems. Transitioning decades of products and services designed in a linear modality into a true Cradle-to-Cradle economy is going to take time. That said, many companies who have embraced the holistic mindset are beginning to (re)design products and services to be as inherently good as possible. 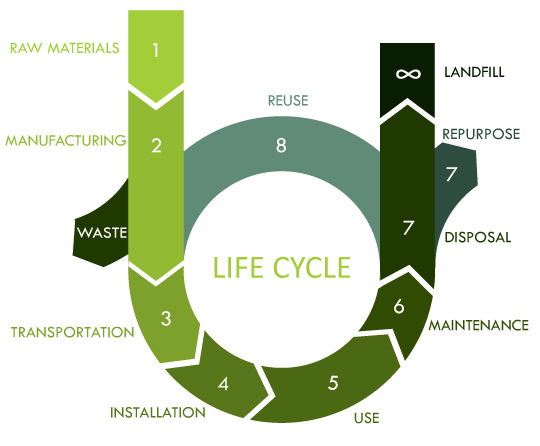 One of the principle tools to evaluate a product or service’s environmental impact is Life Cycle Analysis (LCA). Through LCA an existing or future product or service undergoes a comprehensive assessment that considers its environmental impacts all the way from materials extraction, processing and manufacturing to use and disposal. The breadth of information this analysis requires can be hard to come by so LCA is only as useful as the amount, validity, and relevancy of data available. Despite its complexities LCA is growing in popularity. One of the main reasons for this is Environmental Product Declarations (EPDs). EPDs originated in Europe in 1993 (International Standards Organization 14025) and use LCA analysis as a way to offer businesses and consumers a reliable way to make quantifiable comparisons of the environmental impact of different goods and services. In order to ensure that all products are evaluated in a consistent manner, Product Category Rules (PCRs) are developed, specific to industry, and outline what data is to be used in the LCA. Analyses are then regulated by a third-party to ensure a level, objective, playing field. “We were eager to create and have verified an EPD to raise the bar, move our industry and provide the model and foundation for our competitors to follow. Ultimately this will allow our customers to make apples-to-apples comparisons of carpet products. Now our competitors need to get on board and do their own EPDs” (Greenbiz, 2009). The industry did just that; most recently in June of this year J+J Flooring Group and Mannington Commercial completed EPDs on a variety of their products (NSF, 2013). 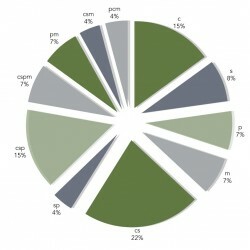 The popularity of EPDs is expected to grow with the upcoming release of LEED V4 Green Building Rating System Standards. In contrast to the Materials & Resources section of LEED 2009 where credits were awarded according to single attributes of materials, such as recycled content, LEED V4 applies lifecycle thinking; subsequently introducing and endorsing the concepts of EPDs. As carpet is found in almost every building or home, CARE looks forward to seeing how the introduction of EPDs will influence carpet recycling in the coming years. It is interesting to note, when CARE started in 2002 there was virtually no closed loop recycling of carpet. Today nearly 30% of all carpet that is recycled goes back into carpet face fiber and backing. Ultimately, whether or not carpet goes directly back to its cradle, the days of carpet to landfill are dwindling! AB2398 is the first mandatory carpet stewardship program in the country. As an extended producer responsibility program (EPR), the bill requires all manufacturers of carpet sold in California to 1) register with CARE, 2) assess a fee to their customers of an additional 5-cents per square yard of carpet purchased, and 3) design and implement a stewardship program using the collected funds. At the bill’s inception CARE was elected by the industry to be the umbrella Carpet Stewardship Organization to all manufacturers. Accordingly CARE was tasked with the preparation and implementation of a Carpet Stewardship Plan that would appropriately and effectively address the bill’s goal in its critical early years; namely, to increase the diversion and recycling of post-consumer carpet in the state of California. Since AB2398 was and still is the first legislation of its kind, CARE has had the exciting opportunity and challenge of developing an implementation plan from scratch. One of the key thoughts behind AB2398 was that the best way to encourage carpet recycling would be to maximize the outlets for PCC, essentially increasing the diversion of carpet from landfills by working from market-based solutions backwards. AB2398’s focus on incentives is unlike other extended producer responsibility programs. Specifically the existing Carpet Stewardship Plan (conditionally approved by CalRecycle in January 2012) pays processors 6 cents for every pound of Type-1 product (high value) sold and shipped and 3 cents for every pound of Type-2 (low value). Since the Carpet Stewardship Plan went into action in July of 2011 CARE has worked with 80 registered manufacturers and 11 registered processors to divert roughly 210 million pounds of post-consumer carpet from landfills and increase recycling output from 8% to over 15% in Q2 2013. Furthermore, greater than 90% of all recycled output is high value material. That said, while the plan has led to substantial success, there is recognized room for improvements. In the past months CARE submitted both a revised Carpet Stewardship Plan and an Annual Report to CalRecycle and various public/stakeholder meetings were held to review their content. While CalRecycle acknowledged the significant recent Plan modifications highlighted in the Annual Report, statute only allows Staff to rule on the actual Plan content. At the most recent meeting this past Tuesday, August 20th, CalRecycle specifically organized their concerns into seven principle issues: goals and baseline, market incentives, amounts of funds in reserve, financial assurance, consumer convenience in rural counties, California staff and accounting and auditing standards. CARE deeply appreciates this feedback and is actively working on adding language to the Carpet Stewardship Plan that will respond and resolve these reasonable concerns in a timely manner. In the end, considering California has several cities, large and small, that have declared goals of zero waste by 2020, AB2398 can help play a major role in helping to accomplish this objective. When it comes to recycling the focus is often placed on the post-consumer end but companies are increasingly diverting their attention to the energy and materials that go into their products before they even reach the market. For the carpet industry, one such example is J&J Industries AquafinityTM Water Reclamation System. 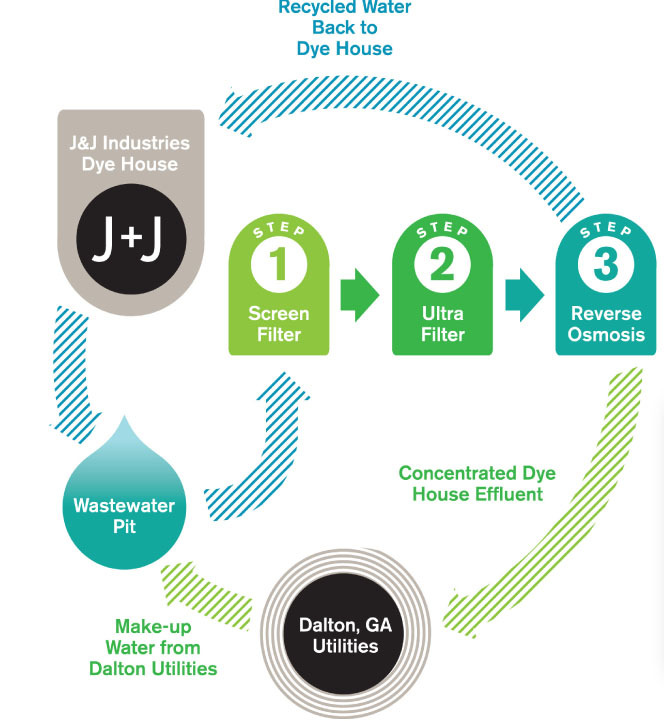 Since the system went on the line in March 2012, J&J has fine-tuned the system to recover 60-75% of their dyehouse wastewater annually. In a state like Georgia where water resources are increasingly strained, closing loops on water use is both good for business and the environment. Specifically, 60-75% of water recovered through the AquafinityTM system translates to 25-27 million gallons of dyehouse wastewater recycled per year. Furthermore, the output water is warmer, cleaner and homogenous which means less energy is needed to warm the water, saving 5 billion BTU’s of energy each year as well. While the system required an investment, according to Howard Elder, Director of Research and Environmental Affairs at J&J Industries, said in a release, “The reuse of wastewater in carpet dyeing is an environmentally innovative process that J&J is proud to pioneer.” Not to mention, based on the system’s performance J&J expects to recover the cost in as little as three years. Perhaps the greenest aspect of the Aquafinity Water Reclamation System however is J&J’s mindset. Rather than coveting the technology to gain a leg up in the industry, J&J has been offering tours to associates, customers, regional offices and competitors since the system was installed. While not specifically in CARE’s mission statement, limiting resources on the front-end of carpet production is also something to be celebrated. In the end, it’s all part of designing for sustainability and fortunately the industry continues to provide us with exciting stories to share! This year the response rate was very high with 39 of the 40 companies directly contacted returning surveys. After careful tabulation and crosschecking, data show that 74% of diverted material is being recycled which is similar to 2011 data (75%). 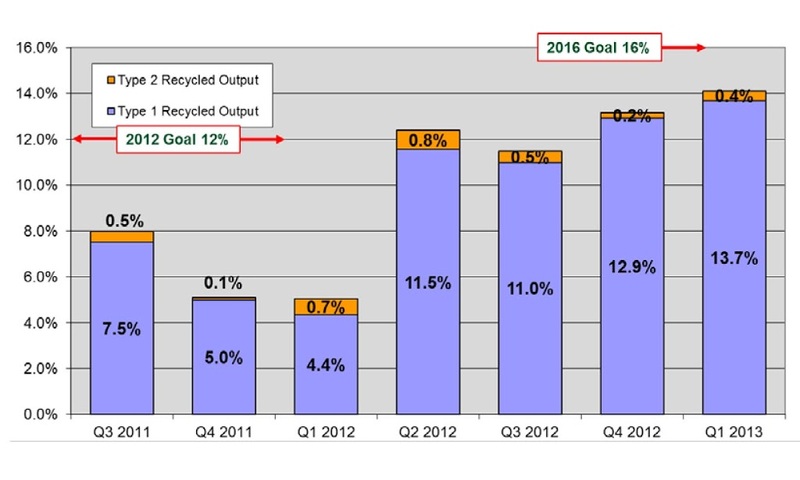 The primary form of recycling continues to be the manufacture of engineered resins, which makes up 63% of the total recycled output. 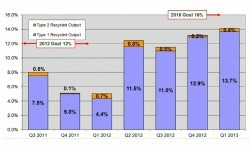 Up 5% from 58% of output in 2011, it is clear that engineered resins are a growing, vital, market in the recycling of post-consumer carpet (PCC). Resins are naturally found in plants, particularly coniferous trees, and are valued for their chemical properties that facilitate many useful purposes including varnishing, glazing, adhesion, and the creation of essential oils. Engineered resins are manufactured to mimic natural resins chemical properties and are thus valuable to the assembly of a wide array of materials. One major user of engineered resins is the automotive industry. 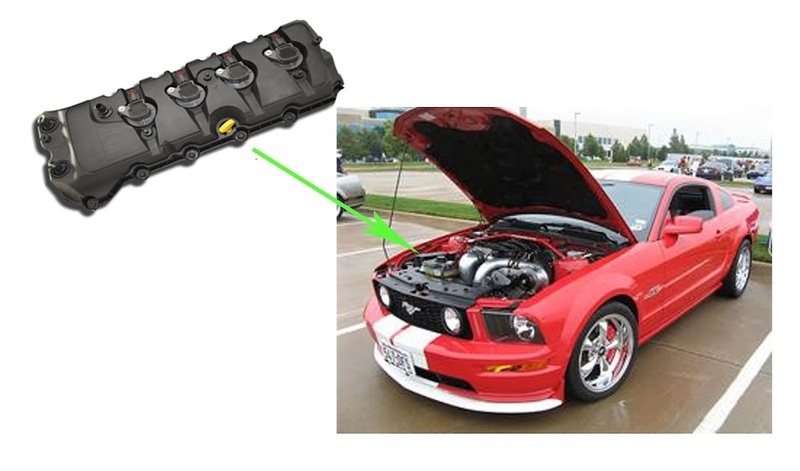 In 2011 Ford began to incorporate EcoLon® into their vehicles. EcoLon is manufactured by Wellman Engineering Resins by grinding nylon-based PCC into fiber and then, through a patented process, recovering the material into a nylon resin. The Dana Holding Corporation then uses the resin to mold cylinder-head covers through its injection-molding process, thus allowing Ford to substitute traditional cylinder head covers (which use virgin materials) for a high-quality, eco-friendly, alternative. Currently found in the Ford Fusion, Escape, Mustang GT and F-150, the Ecolon-based cylinder-head covers were the first automotive product of its kind manufactured from post-consumer recycled nylon. In addition to diverting carpet from landfills, by using EcoLon Ford reduced their indirect consumption of oil by more than 430,000 gallons in 2010. While Ford enjoys greener engines and cost savings, customers also feel the ‘green’ benefits of a greater fuel economy due to the fact that the nylon-based covers are nearly 20% lighter than their previous aluminum die-cast predecessors. Other uses for PCC-based resins include furniture, medical devices, computers and other electronics. Stay tuned for future product highlights! In the world of post-consumer carpet (PCC) recycling only a handful of companies simultaneously play the roles of the collector, sorter, processor and manufacturer. Working in partnership with Reliance Carpet Cushion, Los Angeles (LA) Fiber Company happens to be one of 7% of companies that handle PCC from collection all the way to manufacture. In doing so Stan and Ron Greitzer, owners and founders, manage to avoid one of carpet recycling’s highest hurdles — finding markets for PCC. LA Fiber did not start out with carpet as their premier source material however. Founded in 1983, LA Fiber’s original market was processing PET bottles into fiberfill, eventually transitioning to recycling textile waste from the garment industry. The company had plenty of feedstock until 1998 when revisions to the North American Free Trade Agreement (NAFTA) pushed American textile companies to move processing offshore. In the face of a serious setback, LA Fiber recognized a huge opportunity; once again capitalizing on the age-old adage ‘one mans trash is another man’s treasure,’ Stan and Ron converted their fiber-reclaiming machinery to handle and process PCC. With over five billion pounds of carpet being sent to landfills across the nation per year, LA Fiber acquired an essentially endless supply stream. Beyond recognition of a great source material, the Greitzers also realized an important outlet, Reliance Carpet Cushion. Founded back in 1931 by Stan’s father, Ron’s grandfather, for eighty years Reliance was one of the largest suppliers of foam, fibers, spring coils, etc. to top brand mattress companies including Serta and Sealy. With respect to Reliance Carpet Cushion, although it had been around since the 1960s, it wasn’t until Reliance’s partnership with LA Fiber that the product was able to transform from its original makeup of scrap foam and synthetic fibers to become the 100% recycled eco-carpet cushion it is today. Beyond material recovery, Reliance Carpet Cushion is made with no chemical additives, meets stringent standards for indoor air quality, and is resistant to mold, mildew, and bacterial growth. For buildings striving for LEED credit, Reliance Carpet Cushion gets points for recycled content (MR 4.1/4.2) and low emissions (EQ 4.3). Demand for the earth-friendly carpet cushion continues to grow but while Reliance Carpet Cushion is LA Fiber’s primary outlet, it is not their only one. Processed Nylon 6 and 6,6, PP and PET fibers are also sold as engineered resins, contributing to products ranging from automobiles to decorative pillows. Today LA Fiber is one of the principal West coast recyclers of carpet and other textiles, recovering over 60 million pounds of PCC a year. Their dedication to carpet recycling is not unnoticed. Back in 2003 LA Fiber was the first company to be named by CARE as the Recycler of the Year, setting the bar high as a true trailblazer for success in carpet recycling. LA Fiber continued to acquire more honors including being awarded CARE’s Person of the Year in 2006 (Ron), for Innovations in Carpet Recycling by the US EPA in 2008 and another CARE Recycler of the Year award in 2010, among other honorable distinctions. As for the future, California has an ambitious goal of zero waste by 2020 and Ron sees bulky items such as carpet and furniture as key to making this intention a reality. Fortunately, since AB2398’s passage into law by former Governor Schwarzenegger in September 2010 PCC recycling carpet in California is becoming easier every day. Similar to all laws and ordinances, Ron recognizes that AB2398 is not without its growing pains but he believes the extra funding has made a big difference for carpet recycling, not to mention job growth. Overall, AB2398 has made some major strides in a short period of time, especially considering all systems, procedures and protocols for its administration had to be created from scratch. As the Carpet Stewardship Organization in charge of administering AB2398 in its formative years, CARE is dedicated to ensuring its continued success and is excited to see how the innovative legislation continues to benefit inspiring entrepreneurs such as LA Fiber.